The society’s commitment to take action for sustainable development is globally unique social innovation. 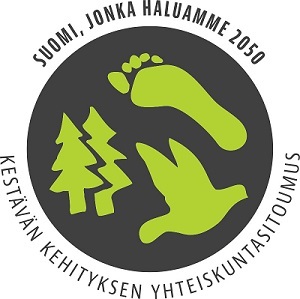 Finnish national commitment to sustainable development is defining central aims for sustainable development reaching to year 2050. Commitment to sustainable development is open, concrete and voluntary way for organizations and individuals to participate into fulfilling the goals of sustainable development. It also enhances national sustainable development work and national implementation of UN’s Agenda 2030 -program. With broad co-operation and sufficient resources the commitments will become the center of national sustainable development work and Finnish success story all around the world. Finnish Environment Institute, Demos Helsinki and Kaskas Media explored how the commitment to sustainable development and it’s tool for commitment to take action should be developed further. Project, funded by Finnish government, also evaluated the impact, strengths, weaknesses and risks of commitment process and tool. In the project, Demos Helsinki carried out two co-creation workshops with the stakeholders and the users of tool. The project has increased common knowledge about the society’s commitment to sustainable development. It has created conditions for wider group of actors to engage into more active and more influencing way to implement sustainable development. The results of project help to develop a constantly renewing and cost-effective tool, which is easy to use and will conduct people to take a part. Read more in Finnish from policy brief, report and blog.